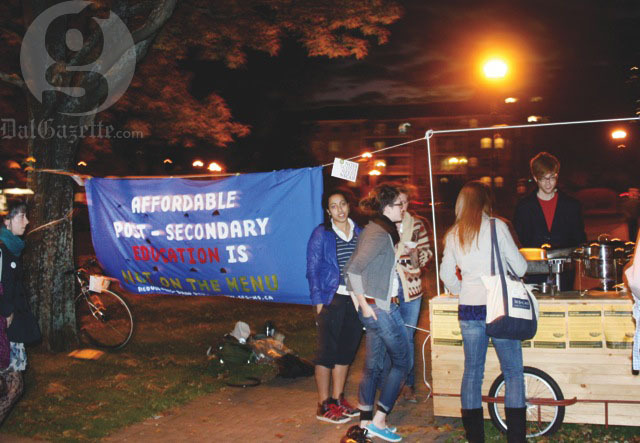 While at Cornwallis Park Nov. 9, Gabe Hoogers was one of many volunteers serving macaroni and cheese to draw attention to student poverty. The numbers at the event rose to as many as 70 at times, with some people trickling in and out. What he might not have been expecting was for an NDP MP and leadership candidate to ask for a bowl. “What is the rationale behind this movement?” asked MP Romeo Saganash, as he tossed his snack’s cheesy container. With a promise to relay the message, Saganash went inside to the NDP fundraising dinner going on at the Westin. The Premier’s Dinner, an event that costs $175 a plate to attend, was being held that evening. NDP supporters and members of parliament were attending, featuring Darrell Dexter himself as a keynote speaker. Across the street from that dinner was an event put on by the CFS. The Reduce Fees Kraft Dinner Cookout had students from Dalhousie, Kings, NSCAD and other post-secondary institutions chowing down on free macaroni and cheese. “We used mac and cheese to show that this is really the reality for students right now. Food bank use is up more than ever, and students need a response to the high costs of post-secondary education,” says Hoogers. “We’re trying to get the public aware of our frustrations with the NDP government right now,” he says. Some Dal groups were involved in the organization as well. “People decide to help out when they see a good cause. The Loaded Ladle donated their little wagon, and we made the banner from donated paint ourselves,” says Hoogers. He says the goal of the event was two-fold. The first goal was to raise awareness for another upcoming event, the Day of Action on Feb. 1. The event also aimed to get the attention of the government. ← Have our ships come in?